I love the muesli from Rich Tree. It's delicious. 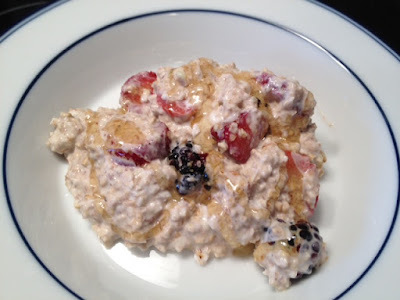 I have tried on a couple of occasions to recreate it by just mixing yogurt and oats. Each time, the results were less then spectacular. Something about the consistency was just off and it was quite dry. After looking at a couple of recipes, I realized that the key is to soak the oats overnight. Before going to bed last night, I put the oats and water in a tupperware to soak. I was on the phone with my sister and told her about it. She also loves muesli and decided to soak some oats too. I texted her this morning to remind her to make the Muesli and she had already made it and said it was delicious. I loved my muesli too and can't wait to try different variations. Of course these are all optional and interchangeable. Any type of nut, dried fruit, or fruit would be good. As long as you remember to soak the oats, it really couldn't be easier. Great substitute for regular oatmeal, I will definitely be having this again.